Hôtel Club Val d'Anfa terletak 50 meter dari pantai di Casablanca. Ia menawarkan WiFi percuma dan terletak di dalam taman yang damai dengan kolam renang serta pemandangan laut. Bilik-bilik di Club Val dilengkapi dengan TV, bilik mandi marmar, bar mini serta balkoni. Ia menghadap ke laut atau taman. Sarapan disediakan setiap hari. Hotel ini menawarkan beberapa bar dan restoran, setiap satunya menghidangkan pelbagai masakan Maghribi dan antarabangsa. Hôtel Club Val d'Anfa terletak di jalan tebing Casablanca, berhampiran restoran, bar dan hiburan malam. Ia juga berada berhampiran dengan daerah perniagaan utama. Ia turut berjarak 5 minit memandu dari Morocco Mall, pusat membeli-belah yang terbesar di Afrika. ينقصه فرش موكيت للغرف لبرودة الأرض . Great hotel and the attractions are walk distance. 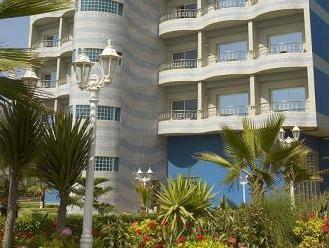 A good stay in Casablanca location ideal for beach, clubs. Travel into the city for the best restaurants. Quite overpriced hotel for stay. But overall it was good. The hotel us we'll catered on the sea side. A bit far from down town. But there are plenty if eating places close by in walking distances.,a Easy to get Cabs to go to anywhere in the city. Morocco Mall is close by. Excellent but need to provide prayer room for non-room occupant seminar/events' participants. My friend and I was travelling through Casablanca overnight and chose this hotel due to location. The stay was nothing but good. The staff were very welcoming and accommodating. Great location, staff, rooms, and balcony views. They have 2 building : 1- New one , 2- Old one try to stay in the new building. Location on the beach is lovely, step outside and walk along the promenade by the ocean. There were plenty of places around to eat within walking distance. On the negative side, there are many bars/clubs around the hotel and in the hotel basement that can get noisy at night depending on which room you're in. Several good restaurants attached to/located in the hotel. Many places open late at night. We enjoyed eating our breakfast outside on the terrace every morning. Plenty of taxis outside so it's always easy to get one but you're somewhat far from the airport, Downtown, and the train station. Staff is friendly and helpful. Rooms were very comfy and clean, bathrooms were lovely with nice soaking tubs Nd plenty of hot water, and everything was decorated in a traditional style with beautiful tile work. All in all great value here. A few things to point out is the breakfast may not be included in your room rate so check on that when booking. Second thing, the cabaret lounge downstairs. If you're not familiar with middle eastern culture you wouldn't pick up on it because it's very subtle. Would definitely stay here again but wouldn't go to the cabaret downstairs. Occean View, Access to Beach and swimming pool. Great location. Good breakfast. Friendly staff. Dirty carpets in the rooms. The hotel has a smell of cigarettes. 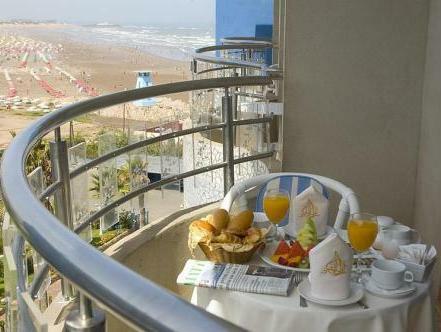 The hotel has a good location right at the beach and with private parking. You can eat breakfast at their balcony. The breakfast is not more than OK and a bit too expensive. The room with ocean view balcony is nice but the room could be more clean. The staff was kind and helpful. Enjoyable, very clean and great value hotel. Close to the beach, and very friendly staff. Hotel is next to the beach but beach wasn't clean or inviting. Nice big rooms with excellent hot showers. About 5-10 mins drive to the mall. There's shops selling bottled water cheaply just next door (drinking water wasn't provided). I really was looking for much more resort type of hotel, and people at the hotel should be more helpful in explaining the sightseeing area. The way to lead to taxi was also abit unfriendy.